A article that appeared in Minneapolis Star Tribune knocked me off my chair. 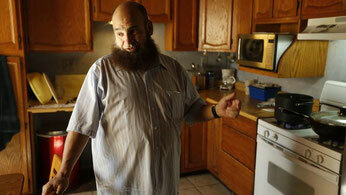 The story was about a devout Libyan-born Muslim who lives in California. He is a foster care parent and only takes dying children into his home so they are not alone. The children are the sickest of sick in Los Angeles County’s foster care program. He said the above words about a dying girl, he held in his arms. The intake coordinator of the County’s foster care program said: “Any one calls - this kid needs to go home on hospice, there is only one name can we think of - Mohamed Bzeek.” Since the mid 1990’s Mohamed and his wife, Dawn (now deceased) have taken in terminally ill children who have no families. His own son, Adam was born with brittle bone disease and dwarfism. Mohamed’s faith has taken him to this ministry. I can hear people say “I could not do that for a million dollars. I would fall apart.” I don’t believe we are to emulate Mohamed because we can’t. A question to ask is: “Where do I want to place myself at a crossroad of human need and respond?" *Photo courtesy of Los Angeles Times.